"Playing the opening range breakout" by Toby Crabel. This is a collection of Stocks & Commodities articles. It's a good summary if you don't want to read his entire book. 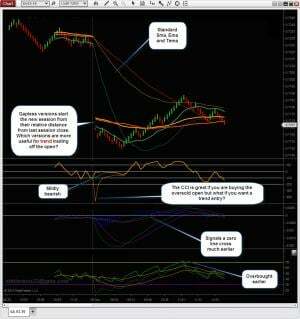 "The 48 hour forex strategy"
This strategy is based on this article in Futures Magazine. NOTE: sorry, the download link isn't working and the BMT website software is not allowing me to fix it, unless I'm doing it wrong. You can download it from this forum post if you want. Details: "The 48 hour forex strategy"
Created a data set for Bitcoin to USD exchange rate for NT7!! Daily Data 1/1/2011 to 12/31/2016. Volume in Bitcoin. Created a data set for Bitcoin to USD exchange rate for NT7!! Minute data 7/28/2016 to 12/24/2016. Volume in Bitcoin. A collection of simple 'gapless' indicators to get you started with your own versions. 'Gapless' is simply this: it ignores the intra-day session gap. Why do this? Ever tried trend trading at the session open but having to wait for your EMA or RSI to catch up? As far as I'm concerned if I am not making money from the gap itself ie. holding a position overnight, then I want an indicator that will show me 'relative' direction from the opening bar. * Useful for stocks, DAX, grains and those trading the RTH sessions. You could plot a ETH chart with a regular indicator next to a RTH chart with the gapless indicator for confirmation. * The indicators have the 'option' to use the gapless concept, else they plot as usual. * EOD type charts will plot as normal, it will automatically use the standard code. * Gapless EMA (Thanks to FatTails for this original NT7 code). *Checked for NT8b9. Cleaned naming. and also includes a 'gapless price proxy'. Use this as a replacement 'Input' for your panel indicators. It works for some but not for others, so there are limitations. Try on a regular Macd. Simply add the regular Macd indicator and select 'Input Series'> Indicators>Sim22_GaplessInputProxy. It will now ignore the gaps. 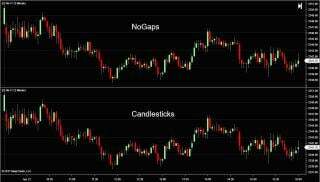 This chart style is identical to the standard NinjaTrader candlestick style except that it uses the previous candle's closing value for the current candle's open value (except when the current bar is the first bar of a session). This eliminates single tick gaps between intraday bars when the last price changes on the first tick of a new bar. As a result, charts appear smoother and are easier to read and interpret, without any price data truly being modified. See attached example of ES. Market replay data for CL, ES, NG, TF. Note that CL ends at 4/22 - for some reason CL will not download from their servers. Installation steps: 1.) Unpack all files into a single folder 2.) 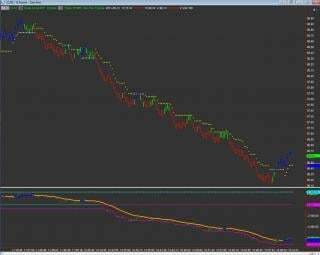 Close Ninjatrader 3.) Move the collection of 8 digit folders to Ninjatrader 7 > db > data 4.) Delete NinjaTrader.sdf, located in the db folder 5.) Once the copy is finished, reopen Ninjatrader and connect File > Connect > Market Replay. Slipknot511 . . . thanks so much for sharing. It's greatly appreciated. What timezone? Or is it UTC/GMT and doesn't matter? Thank you for your hard work, shodson!